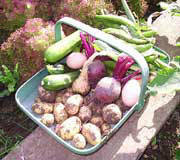 Having certain plants and other vegetables together can give you better harvesting results! There are huge benefits to be had through companion planting. Many flowers and plants grown beside or amongst certain vegetables can not only help to repel pests, but give them extra nutrients all making for better and bigger crops. Let's take the more common vegetables..
By planting Carrots and Leeks next to each other you are getting a double deal, the Leeks will help see off Carrot Fly and the Carrots will see off Onion Fly and Leek Moth. Nasturtium flowers are heaven for Caterpillars, they love them, so putting them beside Cabbages is a real winner! Marigolds give out a strong odour which attracts Blackfly and Greenfly. 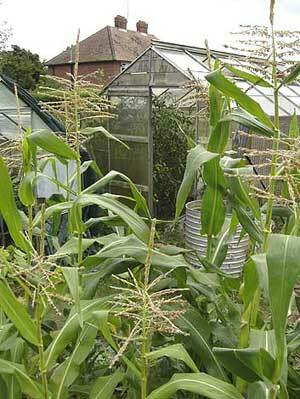 Planting some between your Tomatoes and other Vegetables prone to them such as Broad Beans etc. will help keep them pest free. Carrots are supposed to promote Tomato growth, the only downer being the Carrots may not grow well, but by using any surplus carrot seeds, it's worth the effort. 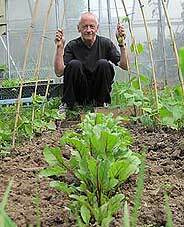 Although I've not seen it written anywhere, I've had huge success with growing Beetroot between the Runner Beans. They're not shaded by the Beans until they are in full growth. This method of growing originates from the American Red Indians and has stood the test of time amongst many gardeners now on both sides of the Atlantic. Basically, it's growing Sweetcorn which provides the climbing facility for the growing of French Beans - then beside them you grow Courgette's (Melons, Squash or Cucumbers also work). This method is 1 x Sweetcorn + 1 x French Bean + 1 x Courgette. You will find it very beneficial in a smaller garden where space is at a premium. Basically they are all feeding off each other; the beans take nitrogen from the air which goes down into their roots and spreading to the other two and the Courgette's give good ground cover keeping the bases of the other two plants cool. So you can see from just these few examples that you don't necessarily have to spend a fortune on Fertilizers and Pest Control Products; nature is a wonderful thing and if we can tap into some of it's secrets, only we can gain from it. 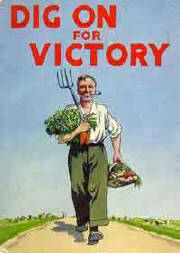 Growing your own saves you money, gives you fresh food, gives you self satisfaction and it doesn't have to be a chore! Here you can see how the Beetroots are well developed by the time the Runner Beans are just starting off..